Dr. Sarah graduated from University of Guelph with a Bachelor of Science degree in 1993. She then continued at the University of Guelph, Ontario Veterinary College (OVC) and graduated in 1997. 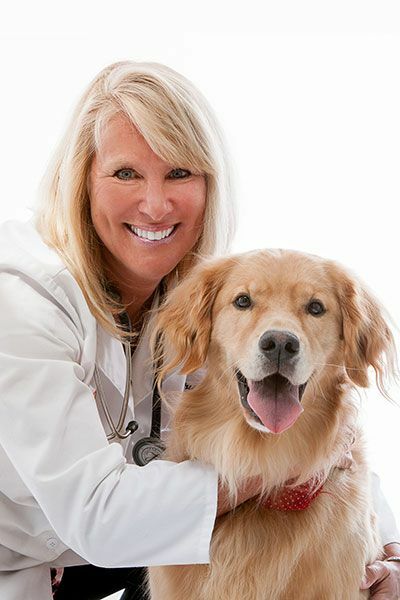 She founded North Oakville Animal Hospital in 2000. When Dr. Sarah was 4 years old, she told her mother that when she grew up she wanted to be a veterinarian. Her close bond with her family cat, Marmalade, who lived to the ripe old age of 21, was her inspiration to choose a profession where she could help and care for animals. She started working in animal hospitals at the age of 15 and knew she had found her passion. Dr. Sarah, her husband Terry Cooke, and their two sons, Gibson and Korben, enjoy the canine companionship of their Rat Terrier, Sony and loveable Golden Retriever, Cheddar. The family also has two crazy kitties, Herriot and Peachy, as well as so many goldfish that they have run out of names! 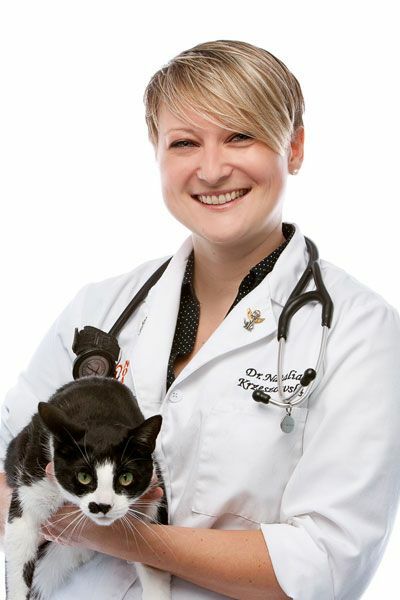 Dr. Sarah maintains a close working relationship with Oakville and District Humane Society. In her down time, she enjoys reading, playing ice hockey and visiting the family's northern Ontario getaway spot. 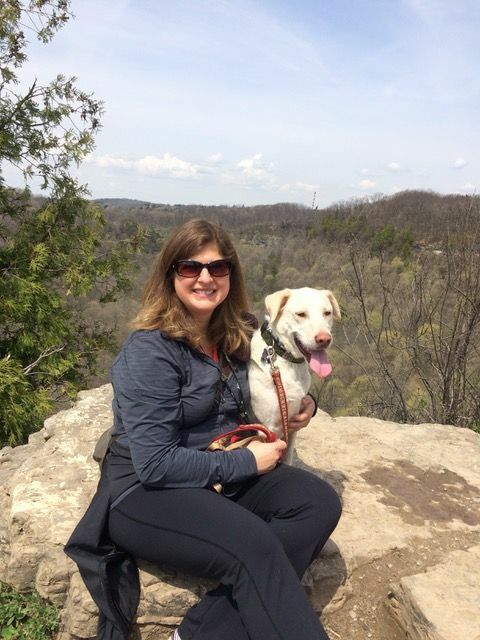 Dr. Jen hales from Newmarket, Ontario, and grew up in a family that always included four-legged members. In Grade 6 when she lost Taffy, her beloved Labrador who suffered from epilepsy, Dr. Jen decided to become a veterinarian. She completed her undergraduate studies at the University of Guelph and then went on to Guelph’s Ontario Veterinary College, class of 2008. Dr. Jen joined the NOAH team shortly after graduation and loves how our small animal practice combines her interest in internal medicine with surgery and dentistry. When she is away from work, you will find Dr. Jen spending quality time with her son Logan and husband J.P. She also loves going to the gym, rock climbing, and playing ultimate Frisbee. Dr. Jen is fairly adventurous and has tried bungee jumping, hang gliding and skydiving. Her family includes two cats, Kitty and Chester, and a Golden Retriever named Ellie. Born in Poland and raised in Mississauga, Dr. Natalia currently makes her home in Milton. When asked why she decided to become a vet, she describes her experience as "more of a calling than a choice" as she has had a life-long affinity for all kinds of animals (including goats!). 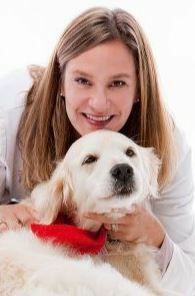 What Dr. Natalia enjoys most about her profession is giving pets the best quality of life so they can do what they do best - provide years of unconditional love and happiness to their people! 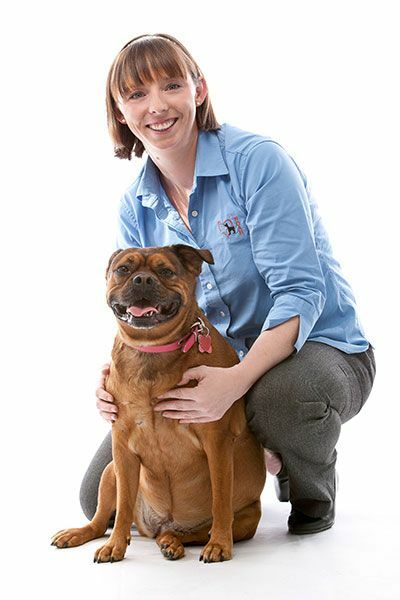 Dr. Natalia studied veterinary medicine at the University of Sydney Australia (class of 2012) and completed her undergraduate degree at the University of Guelph. 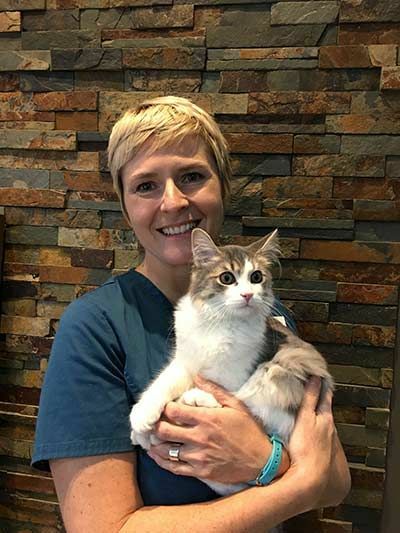 Before achieving her dream of going to vet school, Dr. Natalia worked for fifteen years at a Mississauga animal hospital in a variety of roles. As a veterinarian, she particularly enjoys emergency medicine, internal medicine and client education. She also speaks fluent Polish. Growing up, she had a wide array of pets, including a rabbit, cat, bird, tortoise, a guinea pig named Moe and an American Staffordshire named Diva who loved having her nails painted pink. She is hoping someday to adopt a greyhound. When she's not at the hospital, Dr. Natalia can be found cycling or in the gym. She also enjoys cooking (but confesses to being a useless baker), spoiling her two nephews and spending time with family. Dr. Natalia is also a confirmed bookworm. A 1990 graduate of the Ontario Veterinary College, Dr. Sue joined NOAH in 2016 after practicing for 26 years in the Milton and Oakville Area. When asked why she chose this career, Dr. Sue responded, "I didn't really ever choose to be a vet. I don't remember ever wanting to do anything else and I feel, to this day, that this was what I was meant to do. It’s not what I do, it’s part of who I am." Dr. Sue's wealth of experience spans all areas of general practice including emergency and internal medicine, dentistry and surgery (including orthopedics) and pediatrics. 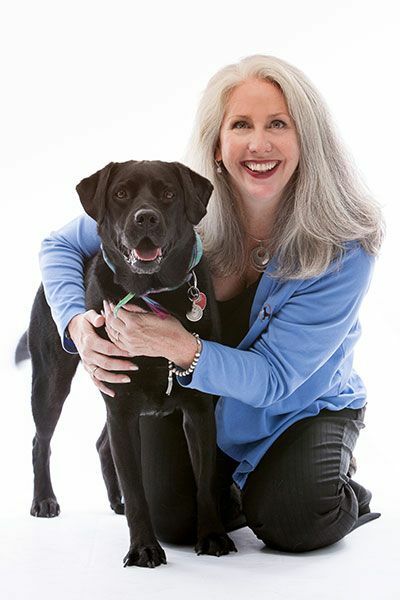 Her compassionate, soft and caring approach helps her patients (and their owners) feel at ease. 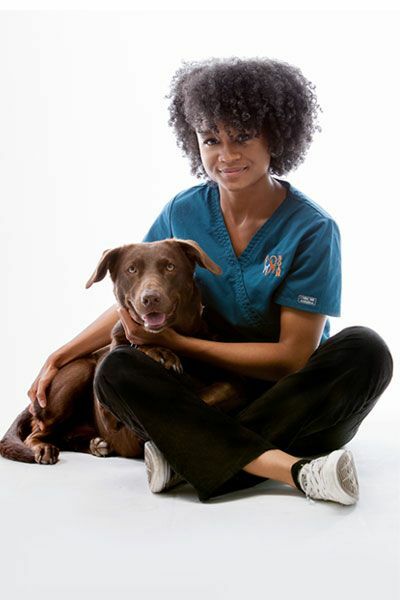 She has a deep understanding of the bond between pets and people and strives to provide both a professional and personal connection with her patients and their people. When she is not working, Dr. Sue enjoys spending time with her husband John (her university sweetheart) and their 2 daughters, Danielle and Sarah. A member of the Caledon Riding Club, she is an avid horsewoman and enjoys riding and hanging around the barn with friends. In addition to her human family, she shares her home with Tori, a Golden Retriever, Ringo the cat and a budgie named Jaws. Dr. Sue also enjoys watercolour painting, hiking, and gardening. 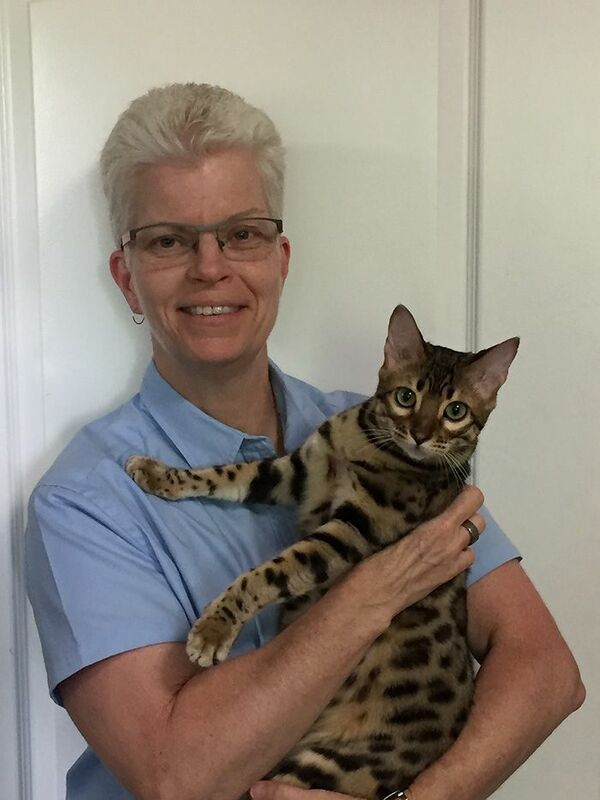 Born and raised in Burlington, Ontario, Dr. Shari Wiseman decided to become a veterinarian because she loves how the profession combines her passion for animals with her desire to work with people. She enjoys the variety of a busy general practice and has a particular interest in feline internal medicine. 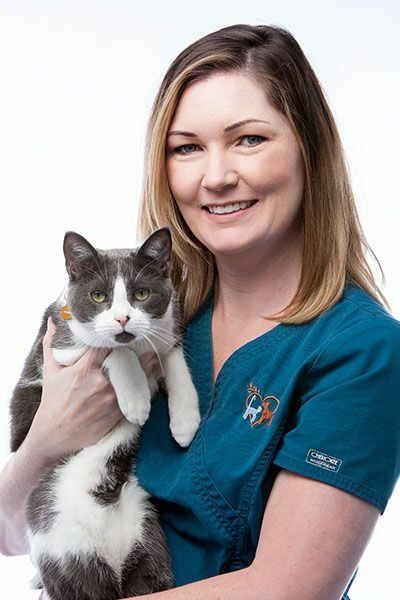 Dr. Shari completed her undergraduate degree at Queen's University and graduated from the University of Guelph's Ontario Veterinary College in 2000. She joined the NOAH team in 2004. When she's not at the hospital, Dr. Shari has a bustling home life with her husband Dave, their three young children (Megan, Benjamin and Natalie), and Cedar, their yellow lab cross. She enjoys spending time outdoors with the kids, hiking, skiing, camping, canoeing, and going to the cottage. In her "spare time", she plays the piano and is an avid reader. In January 2012, Mary Cassidy realized her long-time aspiration to leave the corporate world and devote her energy to career as a Veterinary Hospital Administrator. Some of you may recognize Mary’s smiling face as she worked at NOAH for 8 years as a part-time Saturday Receptionist before joining the team full-time. Mary’s job is to run the day-to-day operations of the hospital, allowing our veterinarians to focus on patient care. Client service is an important part of her role, so please feel free to contact her if you have feedback for the team. Mary’s direct email is mary.cassidy@oakvilleanimalhospital.com. Mary has a BA in Marketing from NYU’s Stern School of Business and worked in corporate North America for 24 years prior to coming to NOAH. She lives in Bronte with Mick, her husband, and her sassy black Labrador Retriever pup, Cassie. When she is not at NOAH, you can find her on a bike, sweating profusely in a hot yoga class or singing with the Tempus Choral Society, an Oakville-based choir. 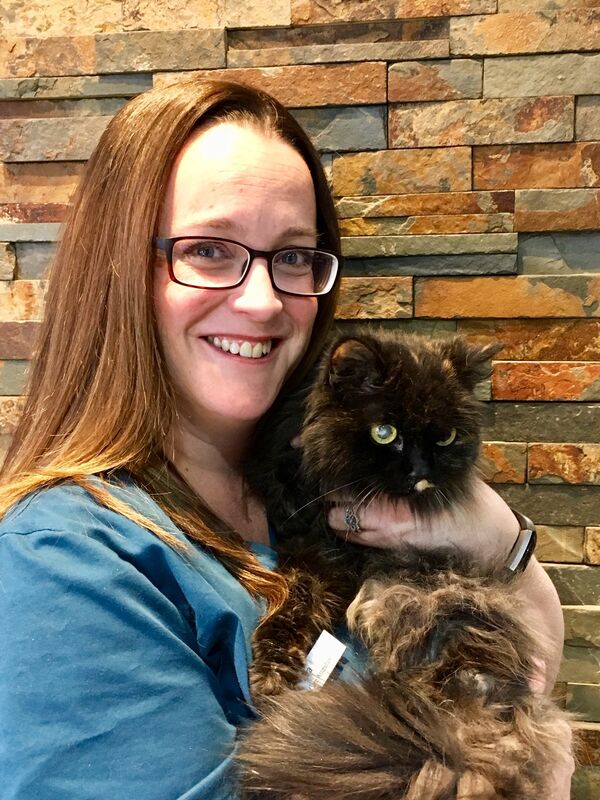 Born and raised in Stoney Creek, Ashleigh came to NOAH in 2011 after graduating from the Veterinary Technician program at the University of Guelph’s Ridgetown Campus in 2007 and working in both general and emergency practices in the GTA. 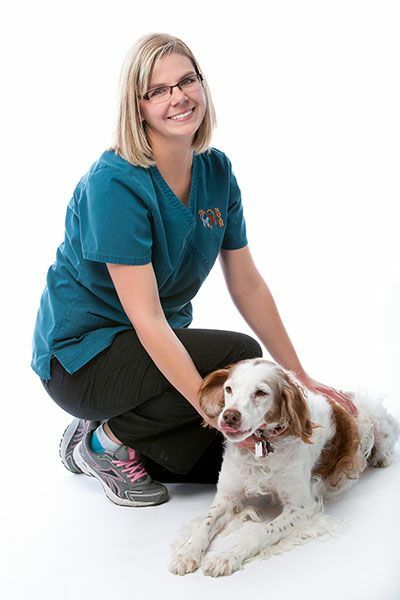 She has a special interest in dentistry and helping clients learn about pet health care. 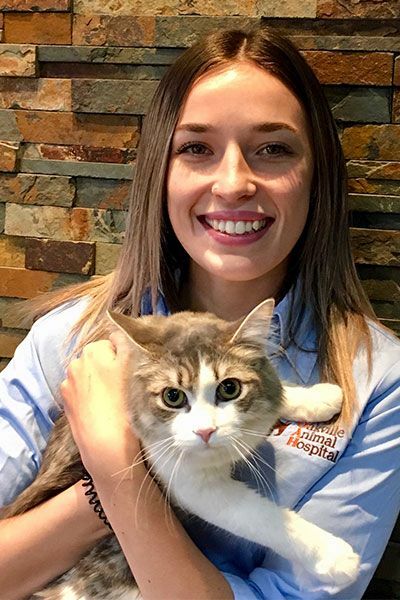 Ashleigh started her work in veterinary medicine as a high school co-op at a small animal clinic and received her General Arts and Science Diploma from Mohawk College in 2005 before going to Ridgetown. She comes from an animal-loving family, and her inspiration to make pets her career came from saving Sandy, a kitten with an eye problem that she nursed back to health. When Ashleigh was in Grade 6, her best friend Sandy developed problems chewing and she was diagnosed with leukemia. Young Ashleigh then decided that she would be a vet one day and cure kitty cancer! Today, she shares her life with a gray and white kitty named Purrogi and her doggie Maddie, an adorable Shih Poo mix. When she’s not working, Ashleigh loves to stay up-to-date with the latest fashion trends, to dance (both Salsa and Bachata), to travel (visiting over 10 countries so far) and to spend time with her nephew Aiden. Her current goal is to see all 100+ waterfalls in the Hamilton area. A Mississauga native, Katherine was motivated to pursue a career in animal health care when, after much parental badgering, Maya the Brittany Spaniel was added to her family on a snowy day in January 2003. When she finally got a "dog of her own" as a young teenager, Katherine realized that caring for and working with animals was what she was meant to do. 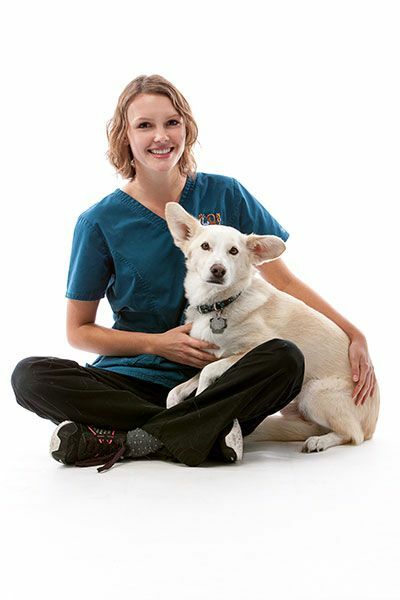 Katherine graduated with honours in 2008 from Seneca College's Veterinary Technician program. She particularly enjoys working with clients and nursing hospitalized patients and gets great joy from seeing pets return happy and healthy to their families. When she is not at the hospital, Katherine enjoys spending quality time with her husband Gordon and daughter Mackenzie - you will find them taking long walks, camping, cottaging and staying up-to-date on all of their favourite sports teams. In addition to Maya, Katherine has a rescue dog named Ava. Born in Port Hope, Ontario, Debbie has lived in the GTA all of her life. After knocking on the door of her local vet clinic every day for weeks, her tenacity paid off – she was hired and has been working with families and their pets for 20 years! An animal lover from Day 1, Debbie enjoys the great diversity that’s part of the Registered Veterinary Technician role and is inspired by working with a team that shares her compassion and dedication to helping pets and their people. Debbie shares her home with a very sweet grey tabby cat called Medea, her husband, young daughter and step-son. Their busy family likes to go camping, hiking, rock climbing and, on occasion, hosting dance parties in their kitchen. She loves reading, crafts, music and hula hoop dance. Born in the Netherlands and raised in Oakville, Emily is a 2015 graduate of the Veterinary Technician Program at Georgian College in Orillia. She started at NOAH shortly after graduation and, prior to that, had worked as a veterinary assistant in another local hospital. Animals have been Emily’s passion ever since she can remember. As a child, she would always pick up cats and other animals in the neighbourhood and bring them home to feed them. She now has two dogs of her own - Roby, a Husky mix with awesome sticky-uppy ears, and Kelso, an energetic Boxer mix. To add to her menagerie, Emily also has a cat named Winnie, and Ringo, a thoroughbred horse. When not at the clinic, Emily loves reading, riding, travelling, hiking or doing anything outdoorsy. Sinead, originally from Burlington, Ontario, lived in Ireland for over 15 year and is a graduate of Lucan Community College in County Dublin. After developing her excellent client service skills working in other industries, Sinead came back to Canada and joined the NOAH team in 2016, fulfilling a life-long dream of working with animals. When you arrive at NOAH’s reception desk, Sinead’s smile is one of the first things you might see, and she always has a bit of fuss for all the pets who visit us. Sinead has been interested in veterinary medicine ever since she was a child. Growing up, her family always included a dog or two – and if it was up to Sinead, there would have been many more strays taken in. Currently, she shares her home with two dogs – George (a Bichon / Shih Tzu) and Ruby (a Boxer / Spaniel). She also has a domestic short haired cat called Salmon. Outside of work, Sinead’s interests include hiking with her dogs, fishing, camping, reading novels and swimming. Karen was born in Thornhill, Ontario, raised in a small town north of Stouffville called Ballantrae and now calls Oakville home. After 18 years in the private sector and working as a Correctional Officer, she decided to make a career change that would bring fulfillment, while making a difference. With her lifelong love of animals, veterinary medicine was a puuurrfect way to marry those two desires. In 1998, Karen started working in client service and management roles in Oakville and Milton hospitals and hasn't looked back since! When asked what she likes most about her work, Karen says that she loves interacting with people, especially "pet people", as she enjoys helping those that share her deep love of animals. At home, Karen's family consists of her wonderful partner Kim and their beautiful daughter Ashton. Their four-legged family includes "Oliver" a mischievous Cockapoo, "Dazey" a Bichon X rescue and two amazing Bengal kittens, "Simba" and "Adele". Outside of work she likes to tend to her gardens, travel, play baseball, hang with her four-legged friends and, on those bad weather days, find a good book and hunker down to read. Born and raised in Mississauga, Erica joined the NOAH team in 2019. She was motivated to pursue a career at a veterinary hospital because of her life-long passion for animals - her dad was a big influence as, from a young age, he nurtured this interest by teaching her about animals and how to care for them. When asked what she likes the most about her job, Erica says it’s the combination of helping both people and their fur—babies. She also loves learning and veterinary medicine provides lots of opportunities to do that! Her animal family includes a dog named Titan, a cat named Jade, and a horse named Bambi. When she’s not working, Erica enjoys spending time at the stable, playing video games and having quality time with her loved ones. Born in Toronto, Canada and raised in the Philippines by her grandmother, Kamilah moved back to Canada when she was 12 years old and joined the NOAH team in 2016. A graduate of the Animal Care Attendant Program at Sheridan College, “KC” hopes to go back to school in the future to pursue her dream of becoming a veterinarian one day. At home, KC’s heart belongs to a Labrador Retriever / German Shepherd cross named Molly. She enjoys jogging with Molly after work, riding her bike, watching anime and reading. A native Oakvillian, Tara Craddock joined the NOAH team in 2018. From the time she was a child, Tara has always loved animals and got her first cat (of many!) from her aunt on her 6th birthday. From then on she was hooked. When asked what she enjoys most about her job, Tara said it’s interacting with the animals in her care, comforting them and watching them get better that she finds most rewarding. At home, Tara shares her home with 2 dogs - Mookie (a Cockapoo) and Minnie (a Chihuahua pug mix) and four cats from ages 2-16. When she’s not at work, Tara loves spending time with her family and travelling to different places, both near and far. She’s also an avid music lover who appreciates going to concerts to experience music in person. Born in Toronto and raised in Oakville, Monica started with NOAH as a volunteer / high school co-op student before joining the team as an ACA. An only child, Monica has had a love of animals ever since she was little. She currently is an undergraduate at the University of Guelph, studying animal biology. Monica is passionate about horses and she rides, trains and shows them. She is a member of the Guelph Varsity Equestrian Team. Hanna has been working as a part-time Animal Care Attendant at NOAH since she completed her high-school co-op with us in 2014. Born in Toronto and now an Oakvillian, she is currently studying Biological Sciences at the University of Guelph. Her interest in veterinary medicine began at a young age, and she started working at NOAH to explore the career possibilities in the field. An avid horsewoman, Hanna also spends time working at a local riding stable. Hanna’s family includes her parents, two older twin sisters, Bentley (a poodle mix), Chevin (a cockapoo) and a turtle. Outside of working with animals and going to school, Hanna loves to travel. She took a gap year before university and traveled to Europe, South America, and the United States.